An increasing proportion of carriageway maintenance budgeting is required merely to maintain the existing road network. The road recycling process involves milling up the existing road materials then spreading and mixing through appropriate binding agents (bitumen emulsions) so that the new matrix forms a new roadbase for the road. Finally an appropriate new surface is applied to the carriageway. The environmental and financial benefits of using existing materials makes road recycling a natural solution to carriageway maintenance and reconstruction. 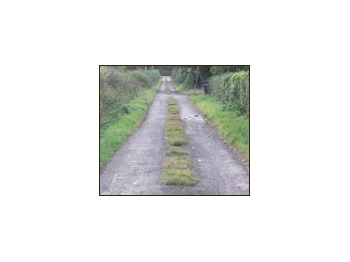 With a Recycled roadbase from a minimum depth of 75mm in a single pass, Recycling is a fast and economical reconstruction solution to damaged roads. Savings of up to 40% compared to conventional overlays. Road recycling is an ideal solution for rehabilitation of roads that have been damaged by spells of freezing weather. Considerable savings can be achieved through a reduction in the need for imported materials, energy and lorry movements. One of the most experienced road recycling contractors in the country. We offer unparalleled customer support at the concept, design, construction and maintenance stages of a project. We can assist in planning recycling projects to provide a cost-efficient alternative to the traditional solutions for reconstruction and repair. 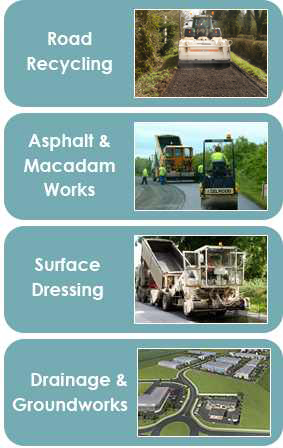 We provide specially adopted and tailored road recycling equipment to provide the maximum efficiency and durability from the existing pavement. All recycled materials are crushed and mixed to predetermined and tailored emulsion quantities with additional aggregates if required to achieve the optimum results from the existing pavement material.